Just what is Microsoft planning next for its Surface line of hardware? We've had numerous hints in recent weeks and months that a Surface Phone or something like it might be on the cards, and now a leaked email is pointing to a "pocketable" Surface device that's been two years in the works. In an internal email obtained by The Verge, the device is described as part of the Andromeda project – Microsoft's plan to roll out different versions of WIndows suited to different devices. Including, maybe, a phone. But it sounds like this new Surface device isn't exactly like a conventional smartphone. It's intended to create a "new and disruptive" device category, as per the leaked email, and will combine "innovative new hardware and software experiences to create a truly personal and versatile computing experience". In other words, it's sounds very much like a phone-laptop hybrid in the same way that the Surface Pro is a tablet-laptop hybrid: not a direct iPhone or Pixel competitor but something that gets close to the full Windows 10 experience on a smaller screen while also letting you make phone calls too. As for what it'll look like, the concepts made by designer David Breyer (one of which you can see at the top of this page) are rumored to be pretty on the mark. 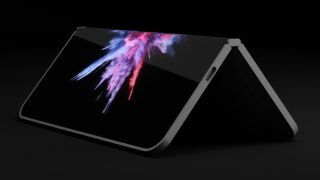 As well as being pocketable, it's also going to be foldable – something Microsoft has been thinking about for a long, long time. We've also heard speculation that the imminent Snapdragon 1000 chipset is going to be powering everything, and that the device will support stylus input like the Galaxy Note. The newly leaked email doesn't add to many pieces to the puzzle, unfortunately, but Microsoft's next Surface device is slowly coming into view.